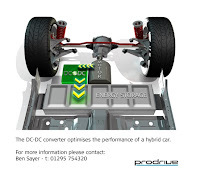 A consortium of British companies, led by motorsport specialist Prodrive, is developing a new DC-DC converter for use in automotive hybrid and electric vehicles, which will be more efficient, smaller and lower cost than those currently available. Sweet - like nitrous for a Prius. Kinda. Not really. 67 horsepower more though. Should make the Prius get up a little bit.